In our final installment of the multi-part series of why organizations are shifting from Microsoft Active Directory® to Directory-as-a-Service® (DaaS), we look at the modern approach of DaaS. Part I (The change in the IT landscape) described the current IT landscape and the problems that it presents for current AD implementations. Part II (The impact of Google Apps) focused on the unique impact that Google has on directory services market. With the shift to their corporate Gmail product, a schism has been created where corporate email lives in the cloud, but directory services is on-premise. This less than ideal scenario is what many IT admins are dealing with today. 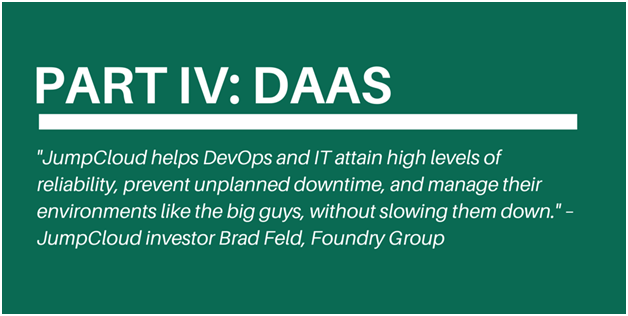 Part III (How DaaS is addressing this problem) looked at how IT admins deal with the problem of having email in the cloud and their directory services on-premise. And now, for our fourth and final post, we dive more deeply into what DaaS is and how it solves the challenges that AD faces. What is DaaS and How Does It Solve IT Problems of User Management? While a simple LDAP and/or AD directory are workable solutions for some organizations, more and more frequently, businesses need a more sophisticated solution for their operations. Specifically, the need for a more advanced directory is tied to the proliferation of adoption of things like Google Apps (now known as G Suite) and SaaS-based applications. Business infrastructure complexity is necessitating more robust directory solutions, too. Specifically, businesses are looking for a directory solution that attains high levels of reliability, prevents unplanned downtime, and reduces risk hazards like compromised credentials. One way to do this is to implement an entirely new directory solution that effectively replaces Active Directory and Exchange. This approach solves three critical challenges with AD and Exchange while not subjecting the organization to further compromises. Having a core user directory to control access to a user’s device, internal services, and critical server infrastructure is an important step in trying to replace Active Directory. User directories enable organizations to have one master record for each user that keeps a record for access and privilege. When synced with Google Apps, this directory creates and provisions services for users such as the right email addresses. Further, this SaaS-based user directory can be leveraged by third party single sign-on (SSO) solutions to create easy access to Web apps. Additionally, with the recent update in June of 2016 we now offer directory-level integration with G Suite. A key weakness in the strategy to move to Google Apps from Active Directory is the lack of device management. AD provides IT admins with a method to standardize settings, files, packages, and other items and enables IT admins to control and manage internal devices, but only on the Windows platform. But as organizations increasingly move to Macs, Linux, and other devices for business use, AD begins to break down. A SaaS-based user and device management solution like DaaS solves these weaknesses and provides a more compelling solution than the on-premise Active Directory. Moving to Google’s email service, but keeping user and device management in house, unfortunately belies the benefit of moving to the cloud. Organizations need to leverage SaaS-based user and device management solutions to capture the full benefit of moving to the cloud—namely, no on-premise equipment to manage, pay-as-you-go subscription models, and elastic growth capabilities. With the tectonic shifts the IT industry is facing—such as moving to the cloud, proliferation of devices including Macs, smartphones, and tablets, and the advent of Google’s innovative Apps suite—modern organizations are turning to a combination of Google Apps along with SaaS-based user and device management. This approach eliminates both Microsoft AD and Exchange, each being expensive, resource-heavy solutions. Organizations that desire to be leaner and focus on core business problems need to use more cloud based solutions. Companies that leverage this approach will see tighter security, reduced expenses, and increased agility for the organization. 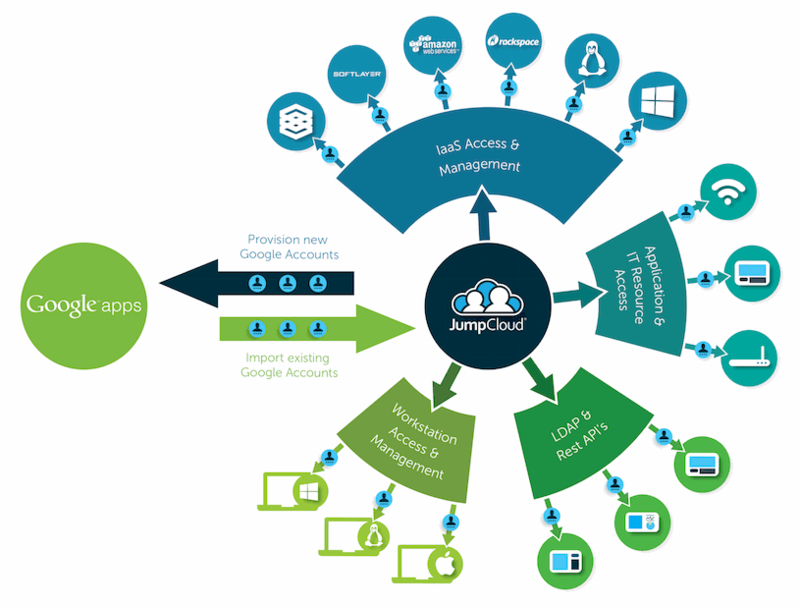 Find out what JumpCloud’s Directory-as-a-Service™ can do for your company. Contact us for additional reading, blog updates and the latest news. Visit our blog or sign up using the form at the top right.